A eulogy acknowledges a deceased loved one's life. 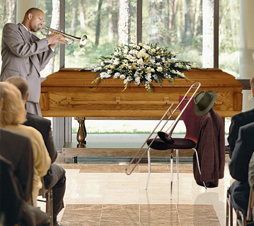 Eulogies are read at funerals. The writing provides information about the decedent including personal quotes and stories, but most of all, it acknowledges the love that the reader had and will always have for that person. There are two common misconceptions about the purpose of a eulogy. Many think it should be an objective summation of the person's life or others feel the eulogy should speak for everyone who is present at the gathering. It does not have to be perfect. Whatever you have written and delivered will be greatly appreciated by all attending. Most important, the most meaningful eulogies are written from the heart. When you are writing a eulogy ask friends and family for their recollections and stories. When you are delivering a eulogy it is perfectly acceptable to say, for example, "I was talking to Aunt Debbie and she reminded me of the time that…proceed with the story." Remember to be honest and speak about a lot of the positive qualities that person had. Leave out any negative details. Eulogies are different in many ways. Some eulogy writers may write a serious piece of work, while others may insert humor into the eulogy. You should write about fond memories and moments that you, family and friends have had with the decedent. You want the guests to relate and understand what you are saying. Delivering a eulogy often is one of the most difficult speeches you'll ever do. It is acceptable and most of the time appreciated to show emotion. Family and friends will be supportive and not judgmental. Keep in mind, giving a eulogy is a noble gesture that people will appreciate, remember and admire. When writing a eulogy, type or write with large easy to read letters. Before delivering the eulogy take a deep breath and relax. Remember that you are surrounded by caring and loving family and friends who support you. It may be easier not to make eye contact with the audience. Take your time and do the best you can. If you need a moment of silence, take it and then continue. Be yourself. Writing a eulogy is an important therapeutic tool to help you deal with the loss of a loved one. Writing helps you re-visit emotions that are important to heal. Gather material: Collect biographical facts such as age, marriage dates, places lived, children etc. Take notes about memories that you and others have. Describe typical behavior and moments that capture your loved one's personality. Decide on a theme: A theme unites listeners to see a wonderful pattern of the decedent's life. Organization: Write notes on file cards. Document one idea per card. Group the cards into piles of similar topics. Sort each pile of cards into a logical order. Write a draft: Use sentences that link to make each topic flow easily into the next. Pay most attention to the beginning and ending. Keep the words "celebration" and "thanksgiving" in mind. You may want to consider including a few humorous moments too. If you aren't used to public speaking you may want to practice reading your speech to a friend or tape recorder so that you can polish up your delivery. You may want to have a back up speaker with you. This may calm you just knowing someone is by your side. Now you should know how to write a eulogy. Whether it's serious or humorous, it will come from within. Try to get your audience involved. Compose this writing for you, your audience and most of all for the person listening above. Make them laugh, make them cry, make them happy to be a part of his/her tribute.